We’ve finally had a shower. On the boat. Obviously we’d been washing by different means throughout the not-so-hot-water debacle. Promise. A friendly gas engineer connected our gas lines to the boiler and cooker on February 7th. Over a cup of tea and a chat, he magically brought our water to the boil and with it, the ability to _have a proper wash_ in our own home. It was one of the more grateful moments in my entire life. Obviously the odd boat jobs and improvements will never end, but this was the one final detail that made Odin a home for me. I’d experienced a few frustrated moments prior to this milestone, but ever since I’ve been dreamily saying ‘I love our home’ on a daily basis. 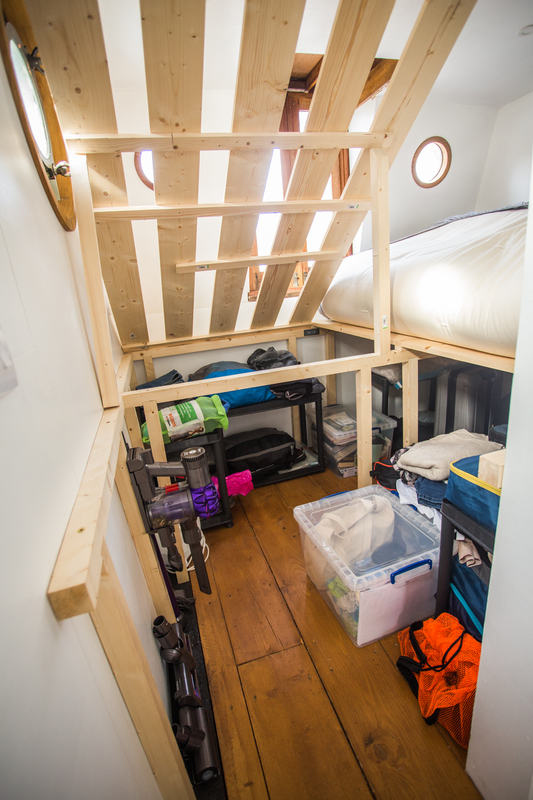 We’ve been sketching and chatting about building a bed with storage underneath ever since we bought Odin. 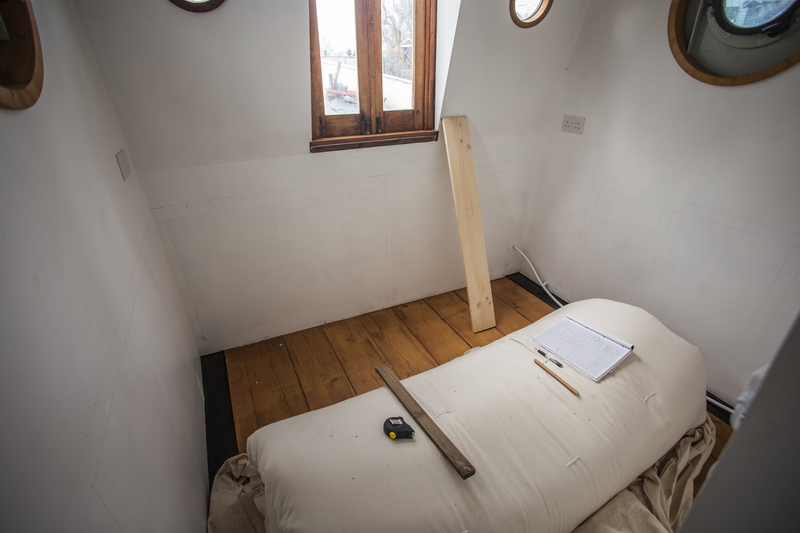 Given that the boat’s bedroom cabin will be extended in June, I had wondered if we might put those plans on hold and continue to sleep on our floor futon for a few more months. Then one day, Chris bought a ridiculously large ruler and started drawing lines on the bedroom walls. 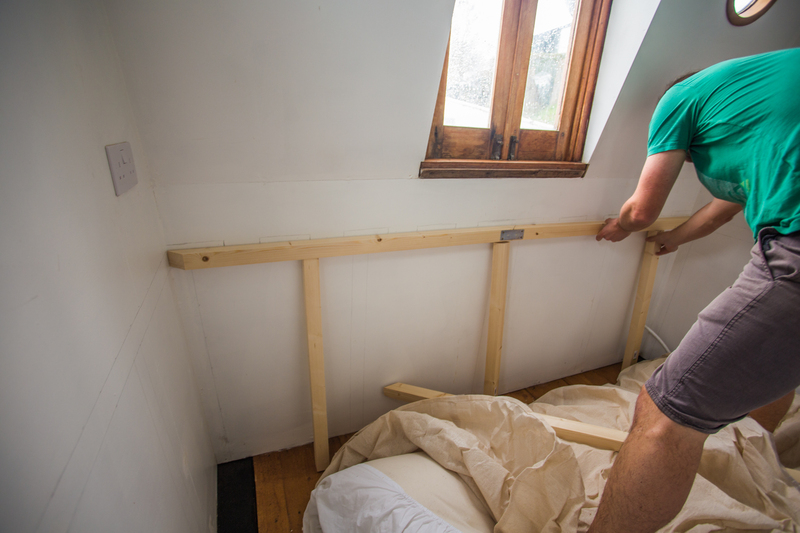 He sketched-up a genius design for a bed frame that covered the full length and width of the bedroom and leaned on (rather than screwed into) the walls. 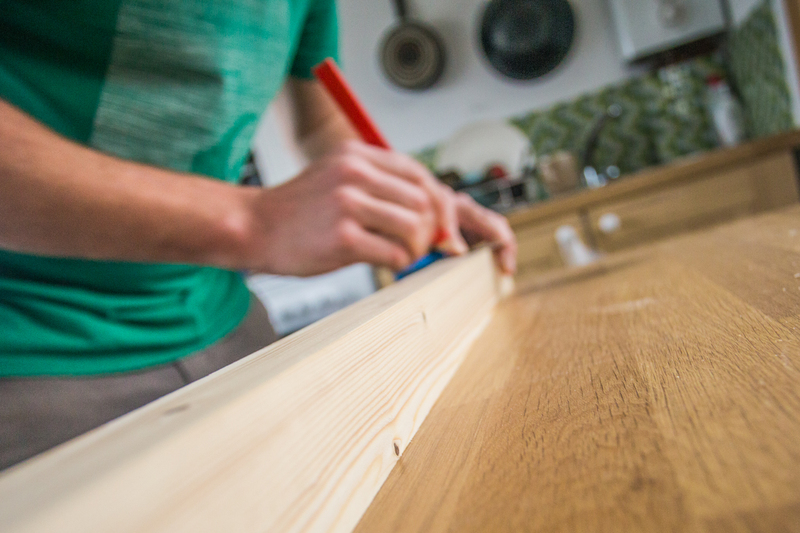 A trip to the timber yard, maneuverers in tiny workspaces and a few experimental, hand-cut, screwed-together joins later – et voila! 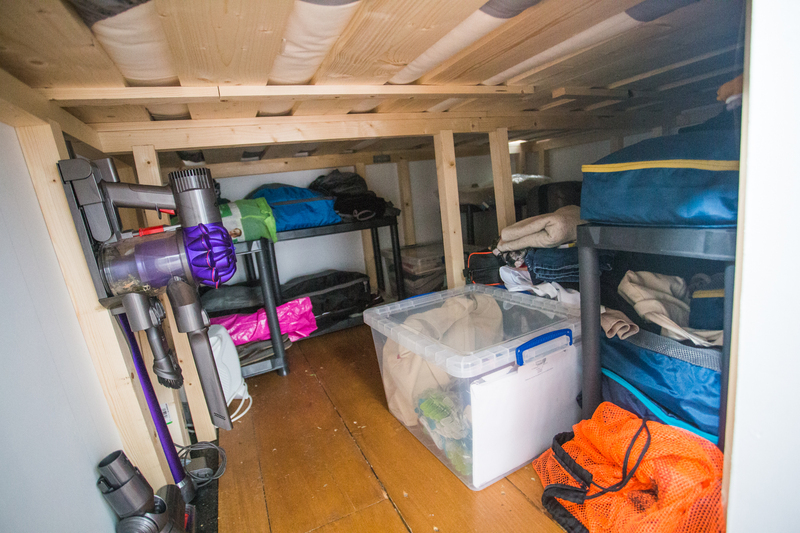 A cosy, lift-up, jigsaw-esque bed frame, 90 cm off the floor with tons of room underneath to store our possessions. 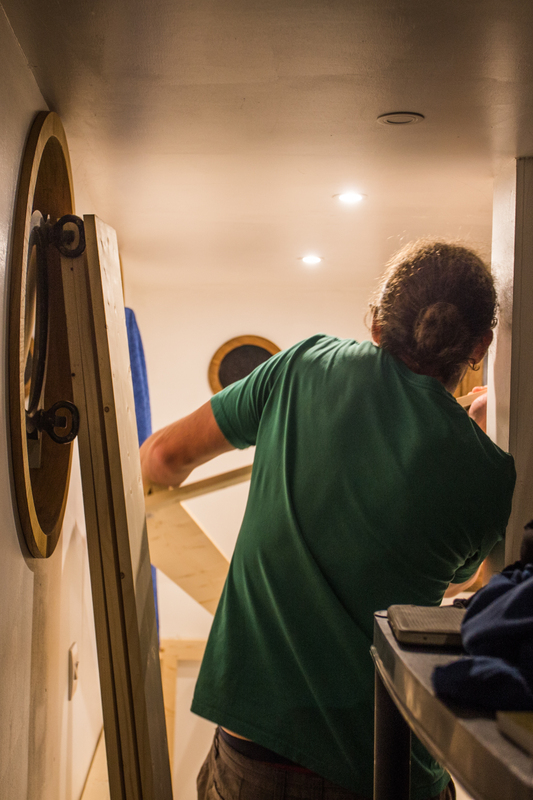 The plastic shelves in the hallway and a few awkward storage boxes in the saloon were soon relocated and we were amazed at how much space we’d won back. 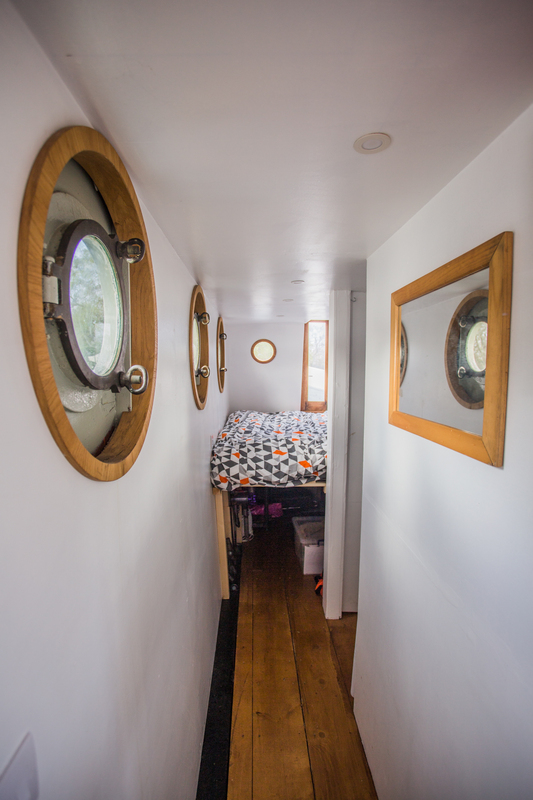 Every centimetre counts when you live on a boat. 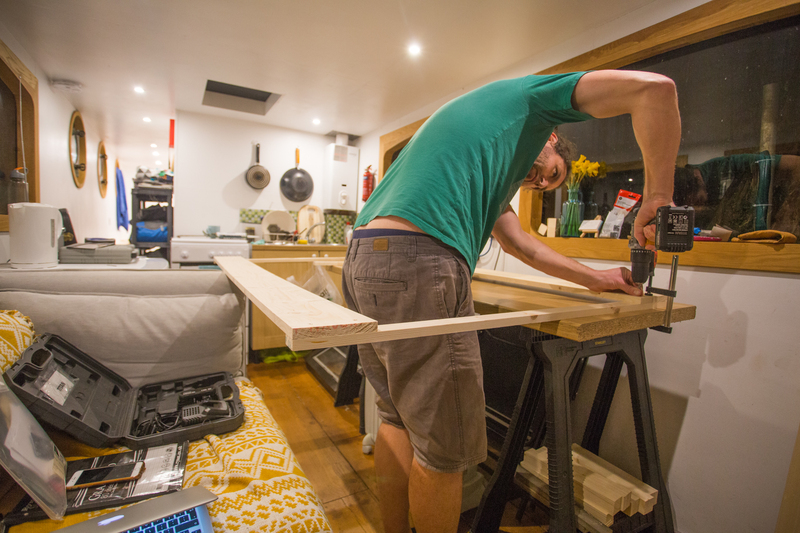 Chris built us a bed in our DIY campervan in New Zealand last year, so he has – of course – taken to saying “I’m constantly building you beds”. He’ll build another in Summer once our bedroom extension is done, so maybe there’s some truth to that. 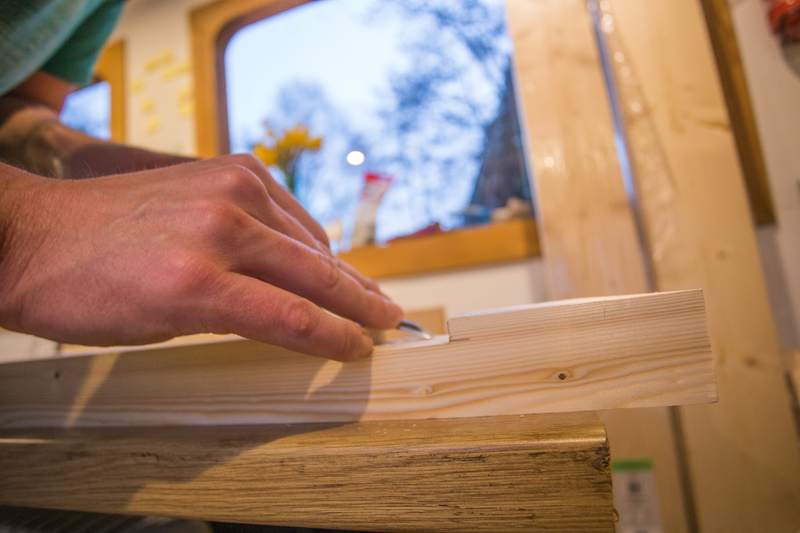 We hope that we’ll also be able to re-use the current frame components for the new bed, so I’ll let you know how that goes. Remember we have a mooring on an island without bridge access? Well up until February, we’d only been rowing ourselves by oar to get from the shore to the island and back again. The neighbours warned us that the river can flow fast in the winter time. In fact, our nearest neighbour was once swept away downstream – without his phone – in the middle of the night. The river Thames was on a red warning from the environment agency that day and it got the better of his electric engine. Meanwhile, his 8-month-pregnant wife was beside herself worried sick for hours. It can happen. We knew it was only a matter of time and we’d be over-powered on a fast-moving stream, so we dialled up the search for an engine for our little tender. At the London Boat Show in mid-January, we came across a hilarious little outboard motor converted from garden strimmer petrol engine. You know, those whipper snipper contraptions you use to cut the garden weeds around the fence? That. Its called a Aquaparx 1.2hp Petrol Outboard Motor. While it probably won’t help us in times of serious fast flooding, it has already served us well on a yellow warning stream in February. The island kitty seems a little too fond of it, if you ask me. Our garden tool engine putt-putts us up stream and makes light work of ferrying guests onto our boat home or to the pub in Hampton. Is there room for the geetar on this vessel?